user warning: Table 'drupalgastronomer.comments' doesn't exist query: SELECT COUNT(*) FROM comments c WHERE c.nid = 183 AND c.status = 0 in /home/dgabriner/gourmetgastronomer.com/modules/comment/comment.module on line 992.
user warning: Table 'drupalgastronomer.comments' doesn't exist query: SELECT c.cid as cid, c.pid, c.nid, c.subject, c.comment, c.format, c.timestamp, c.name, c.mail, c.homepage, u.uid, u.name AS registered_name, u.signature, u.picture, u.data, c.thread, c.status FROM comments c INNER JOIN users u ON c.uid = u.uid WHERE c.nid = 183 AND c.status = 0 ORDER BY c.thread DESC LIMIT 0, 50 in /home/dgabriner/gourmetgastronomer.com/modules/comment/comment.module on line 992. The strangest thing about this endeavour is that I am allergic to soymilk. Yup. I am Asian. I am lactose intolerant. I am allergic to soymilk. Yet... I refuse to shy away and head for the rice milkaisle. Christ. Some people are just so good at marketing free stuff. My mother would scoff at the fact that rice milk is basically the dust that coats rice kernels + water. So my rebuttal to physiology is to eat as much stinky cheese and soy products as I can. Makes sense, right? My best memories of soymilk were when we used to go visit my grandparents' grave and eat at this one Beijing style restaurant. We would order hot sweetened soymilk (dou jiang) and pieces of fried dough, an oriental coffee and doughnuts if you will. My dad's patients sometimes bring him cartons of their own soymilk, still warm to the touch. I envy him. He gets the best presents--like a roasted duck, one half wrapped in a take out carton, the other wrapped in a plastic bag. To be more than honest, this soymilk was just a pit stop to homemade tofu. I stole the recipe from Just Hungry. She actually has a much more informative post. 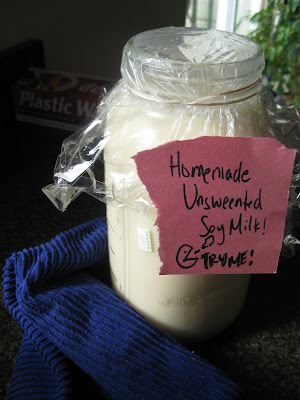 Instead of repeating her didactic recipe, I will show you how simple and intuitive it is to make soymilk. SUMMARY: You will have to start the night before to soak dried out beans. The next day you will blend boil and strain. Very simple. Just a bit time consuming. WARE: This is the most important part of the process. Having the right stuff. You will need a blender (or immersion blender), a large pot (probably 6-7 quarts), a strainer, and some cheese cloth. 1. Soak beans in a large bowl of water undisturbed all night long. 2. In the morning, uncover your beans. They should be twice the size they once were. In batches, blend the beans to a thick yet light puree. There will be foam and froth. Just ignore it. In fact, the froth looks so deceivingly inviting that you make think that you have already arrived at a delectable morning beverage. You haven't. Move on. 3. Put on a large pot of water, filled with 8 cups of water, on the stove and begin to heat on high. The pot must be large enough so that the liquid is about 1/2-2/3 up the side of the pot. As the water is heating, pour the puree into the pot. Continue to heat. 4. Eventually your mixture will come to a boil and develop a bubonic foam growth, like a top hat willing on top of the soy milk. Turn down the flame to a medium or at whatever setting you can control that mangy fro. Splash some cold water onto the froth if it threatens the top of your pot. Boil thusly for 20 minutes. 5. Line a strainer with cheesecloth. Place a bowl large enough to catch all the liquid underneath. If you don't have a large bowl, manage straining in batches. 6. When the boiling mixture looks as if it has spit into soy milk and lonely shards of ruffage, it is done. Kill the heat and pour through the strainer. Cool or continue on to make tofu! Wheeee! Or eat with fried doughnuts. Of and about that other part of the mixture, the fibrous part. They call that Okara. I am not sure what i want to do with something that has essentially given all its nutrients and taste to thesoymilk, but I am sure I can find something to do with it... thoughts?